I’m happy to introduce the return of Our Lil’ Pumpkin 4 Tier Diaper Cake as a seasonal entry to our themed based diaper cakes. 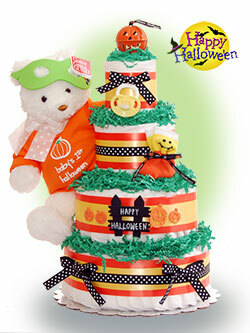 I really like the Gund Brighton Bear that comes with this cake. Gund offers such great quality products and is really a mainstay in the baby gift world. This bear will sure be something the new baby grows to enjoy over the years as a keepsake. Since this is a 4 tier design, we include 70 Pampers Swaddler 1 diapers along with a Halloween themed onesie that says Baby’s 1st Halloween. A silicone pacifier and candy corn themed infant socks are also included. As always, your comments are appreciated regarding any of our diaper cake designs. I hope you will consider this design as a practical baby gift for the new family to be in your life. Since we are featuring this item as our October 2010 cake of the month, we are including free shipping (a $12.95 value) anywhere in the lower 48 states. I’m happy to inform our customers that we have released our Limited Edition Diaper Cakes. This is a new category of newborn diaper cakes for our company. I designed these to match popular baby themes at specific price points that would be attractive to baby gift buyers. I worked with our suppliers to find cute items that would work for this line realizing that supplies would be limited. We’ll be continuing to add to this line moving forward as these cakes sell out. As always, I appreciate your feedback on our offerings. I hope you enjoy this new line up. The complete press release regarding this line can be found here. One thing I have noticed from attending baby showers myself, is the overwhelming amount of baby clothes the new mom receives. I think many people buy the clothes because it’s a “safe” baby gift or in many cases because they really don’t know what to buy or have the time to find a unique gift. The reality is the new baby is most likely to grow out of all the new clothes the new mom receives before they can even be worn. And it the grand scheme of things, are clothes really going to be the most memorable baby gift the new mom receives? Other bigger ticket gifts, like strollers, car seats, etc… are typically purchased by immediate family members and are obviously required items for the care of the new baby. Friends and co-workers don’t usually purchase these items because of their cost or highly personalized preferences by the mom regarding these items. This leaves a pretty big void in terms of what kind of baby shower gifts to buy. Based on my experience owning Lil’ Baby Cakes, I have put together 3 reasons why a baby shower diaper cake makes a unique gift based on my interaction with my customers over the years. One thing is for certain, new baby’s require lots of diapers! In fact, for about 2 years of so, diapers will be one of the ongoing expenses the new family will have in the care of the baby. While a diaper cake is not going to make a huge dent in the quantity of diapers the new mom needs, it’s really a unique way of offering diapers as a gift item to get the mom started. Since many diaper cake designs offer baby care items (lotion, shampoo, etc…) and baby toys, the new mom and baby will surely benefit from this assortment of items. 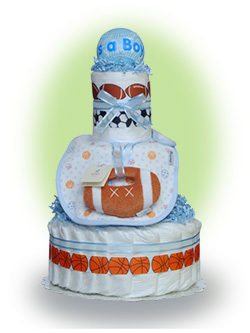 I have tried to design my diaper cakes to match the most popular themes available today. I realize that people have many different budgets to work with so I want to offer the best selection of theme based designs all at different price points. Jungle themes, ducks, and contemporary designs continue to be very popular and really offer a can’t miss gift for the new mom. I also routinely get requests for custom designs which I really love. These designs, which are typically 5 tier cakes, are the focal point of the baby shower. Many of my customers design their whole baby shower around their custom diaper cake. Whether you are looking for a simple 2 tier design or a “one of a kind” unique custom design, I’m confident we can accommodate you. When I look for gifts to buy my friends or family members, I’m always on the look out for something memorable. After all, we want the recipient of the gift to really love it and remember it because it was unique. My feedback from our customers is that diaper cakes truly are memorable gifts. I get many emails from new moms stating they are not going to use their diaper cake, but instead want to keep it as a decoration in the baby’s nursery. Since many of our designs also feature plush animals by Gund, the new baby will have a memorable keepsake they can cherish as they grow older. I’m sure many of use know kids who still have that first teddy and can’t let go of it! We’ll I hope these reasons will help you if your unsure about a baby gift to buy for that upcoming shower. As always, if you have any questions, feel free to write. I’d love to hear from you.